But no. Angie had some kind of crazy idea. Make the healthy dish with Pineapple and Greens. Whaaaaat? Noooo, Angie! Cauliflower is the way to go, cauliflower, girl!! But I kept thinking and thinking and trying recipes in my mind. I seem to have a “taste memory” in the same way artists can recreate a picture memory. Do you do that? Some people can and some can’t. It’s weird. But I knew this couldn’t be just an ordinary “make a dish and toss some greens into it” type of recipe. The greens have to be a cohesive part of the dish and just as delish as the rest. I narrowed it down to little steamed collard packets with kind of Hawaiian flair and Thai Pineapple Fried Rice with Kale. You can see what won out! And I got compliments on the kale in this dish, so I’m glad I picked it. You always have to be careful when making fried rice not to introduce too much liquid or you’ll end up with mush, and greens need a bit of steam of some sort to get them going. So I did a nice saute of the greens with some aromatics, covered them for a quick steam, then removed the greens and placed them aside on a paper towel. I proceeded with the rest of the recipe, then rolled the greens up in the paper towel and gave them a quick squeeze. Back in they went, all was scooped into my hollowed out pineapple, garnished with cucumber, lime and cashews. It was a bit of a masterpiece, if I do say so myself…I felt kinda all exotic in my kitchen for just a minute or two. Excuse me, waiter, can I have a Mai Tai over here? I made this very simple and didn’t use any additional protein like shrimp or chicken. You could certainly add leftover chicken, diced or shredded, or marinate a chicken breast or thigh or add some shrimp if you’d like. Cook the shrimp or chicken first, then set aside and proceed with the rest of the recipe. I also used jalapeno because I couldn’t find any Thai chili peppers – it seemed just fine. Fried rice is always adaptable. Cabbage, red or green, bell peppers, green onion, and all kinds of vegetables could be added or substituted, here. January is a wonderful time to buy pineapple if you’re in the US. The prices drop drastically and the pineapples are gorgeous. Try Aldi if you have one nearby – you’ll find pineapples for a pittance. I buy a lot of my nuts there, too, including the cashews for this recipe. Set aside pineapple halves, upside down on a plate to drain. Heat oil in a large skillet or wok. Add onion or shallots and hot pepper and saute until nearly softened. Add kale and stir for a minute, reduce heat, add a lid and steam for several minutes. Remove kale, leaving onion and jalapeno behind (no need to be perfect) and place kale on several layers of paper towel. To the skillet, add the last tablespoon oil, then add the eggs. Leave for a minute until they’ve just started to set up, then stir. While still very moist, turn up the heat, add the rice and toss and stir as the rice heats. Push the rice aside and add the pineapple, stirring just until a bit of color is picked up. Add in the raisins if using. Add the seasonings: the white pepper, curry powder, fish sauce and soy sauce. Taste, add salt if desired. Continue to toss and stir until rice appears nearly dry again, 1 to 2 minutes. Roll the greens in the paper towels and gently squeeze. Add the greens back to the rice, toss together as they warm through. 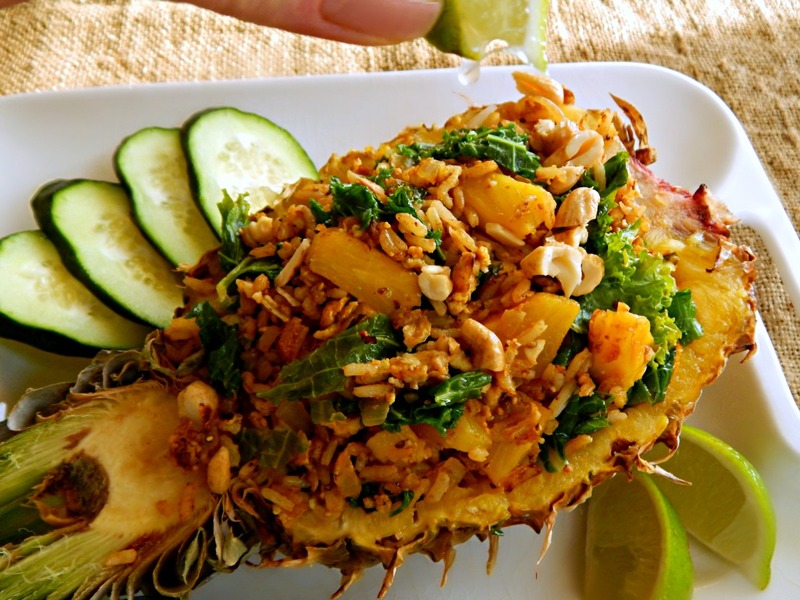 Remove from heat, fill the pineapple shells with the mixture and garnish with chopped cashews. Serve with cucumber and lime. Note: If your pan isn’t very large, it’s best to make two batches rather than overcrowd the pan. Cashews: Toast the cashews in a bit of oil over a high heat, stirring and shaking constantly until they pick up a tinge of color. Remove from hot pan immediately onto paper towels to drain. Lightly chop. So proud to be featured on Fiesta Friday’s Challenge! This entry was posted in Click here for Bargain Meals, Click here for Fabulous Food Posts and tagged Asian, Bargain Meal of the Week, cashews, complete skillet meal, fried rice, Greens, Hot Peppers, Kale, leftover rice, Nuts and Seeds, Raisins, Rice, Thai. Bookmark the permalink. Thanks much – I was surprised at how good it was and the pineapple was magnificent. I never liked pineapple when I was young because I had only had it canned and in things like jello salad or insipid pineapple upside down cake! How wonderful you were able to make that trip – Was your son on a mission of some sort or working? Hey Mollie– He studied Chinese in school and when he graduated went to travel there for a summer, got a job with a curriculum company and stayed 10 years! Married Jodi from Hunan and they had our 3 grand-girls. But about 3 years ago they moved back to CA. I’m happily thankful to have them all so close! Jodi and the 3 girls have been back in Hunan staying with her folks for Chinese New Year– come back Monday. OK, that’s more than you asked!! I can really blab on… hugs Mollie! That sounds (and looks!) delightful! I’d never have thought of combining pineapple with kale, but now I can’t wait to try this. Of course, your gorgeous presentation plays a big role in that, too. It’s like a vacation on a plate! I also know that sense of having a “taste memory” (what a great description). It annoys me to no end that some people claim that you can’t imagine (or dream of) flavours, because I do it whenever I cook something new or read a recipe and I swear it works! So I love it when I read that other people do this, too. Shutting up now! Looking forward to trying this recipe. Thanks for sharing! Thanks, and the rice was fun! You eat with your eyes first, they say! & I’m glad I’m not alone in that taste memory (or imagination/dream)! I always wonder if that is why I enjoy reading cookbooks?! Like some people read novels…Of course it hasn’t been all that long since cookbooks didn’t have pictures at all, or if the did, it was a few here and there or a few pages in the center. Maybe that’s part of why my imagination plays such a big part? I definitely prefer cookbooks with pictures (or food blogs) these days, I have to admit – food photography really is an art form. But old (or properly ancient) cookbooks that have no photos are also fascinating. I have to admit that I haven’t yet paid attention to whether I put more effort into imagining the ingredients/flavours when there are no pictures. But I might be! Well, they still recommend fish because of the healthy fatty acids and iodine and stuff, while at the same time warning about mercury poisoning etc… and no sushi! You just can’t win! I love the idea of using pineapple in fried rice! Great job and it looks delicious! Hi Antonia, and thanks! It was fun and I’m now seeing pineapple in a whole new way, thanks to Angie!! Pineapple is one of my favorites. This looks so exotic and fun and sounds delicious. What a fun way to serve dinner! Thanks, Carlee! It was a hit with me AND the folks, so that’s always a plus! What a scrumptious rice dish with so many layers of flavor, Mollie! It was delish! I wanted to stuff some bell peppers with the leftovers, but there weren’t any! I am a huge fan of pineapple. Love this Mollie. Beautiful presentation and delicious!! Thanks, Laura. After I warmed up to the idea I thought of all kinds of things I could have made – but I loved this! This looks absolutely delicious Mollie. Love the combination of flavors you have going here. Plus the cashews and the presentation itself is dynamite! Thanks much – it was a lot of fun and hollowing out the pineapple made it feel so special. I’ve come to the conclusion that I need more pineapple in my life and I loved how it flavored the rice through and through! Wow, Mollie! This is so yummy and so very beautiful! I want to eat some right now! Good thing that I have some leftover pineapple…here I go, off to the kitchen! Good job! Thanks! We have leftover, too, lol!! I felt like I was at one of those restaurants back in the 70’s – I think we used to eat at one in twin cities, I want to say Trader Vics? I’m gonna have to stop by and see what you guys have been up to back home! I LOVE pineapple fried rice! I’m not a huge fan of pineapple in savory dishes, but pineapple fried rice is an exception. Yours looks delicious! Thanks, Lina! It was my first time photographing something like this, the light was lousy and I was disappointed in how they turned out, so I appreciate the compliment! Next time I’ll do better! Although I don’t hollow out pineapples very often, lol!! Wow you went all out on this Mollie, it’s absolutely gorgeous! My “kale-hating don’t put fruit in my salad” husband would pooh-pooh this but I am all on board with it! And you put chile pepper and curry in it, even better. I love a spicy fruity salsa type flavor. Wow what a gorgeous dish Mollie. I had a cauliflower obsession and now it’s pineapple, I can’t get enough. Love this dish. It’s funny, but now on Jan 30 I’m thinking of all kinds of greens & pineapple combos!! Thanks to Angie. 🙂 And this dish was really good, if I do say so, lol!